Toyota has sold more than one million hybrid vehicles in a year for the first time, confirming that hybrids are now a mainstream choice for motorists. The company said today it had sold its one-millionth hybrid this year during October - a total that had risen to 1,028,900 by the end of the month. The global tally so far this year represents an increase of 63.6 per cent over the full-year total of 628,989 hybrids sold in 2011. Sales of petrol-electric hybrids equate to approximately 14 per cent of Toyota's global sales for the first 10 months of the year. Toyota Australia executive director sales and marketing Matthew Callachor said hybrids had now become a regular choice for motorists alongside petrol and diesel engines. "Toyota has almost single-handedly developed, built, promoted and sold hybrid cars to the point where they are now a mainstream choice for the motoring public," Mr Callachor said. "We expect hybrids to continue to grow in popularity as Toyota is joined by other carmakers in offering hybrid cars here and overseas - a development we strongly welcome," he said. "A growing number of people now understand that petrol-electric hybrids offer increased performance as well as substantial fuel savings due to the combination of an efficient petrol engine and an electric motor. "Our own locally built Camry Hybrid develops the most power of any Camry while using the least amount of petrol in the range." The latest hybrid milestone fulfils Toyota's long-standing pledge to achieve one million hybrid sales a year as early as possible during this decade. 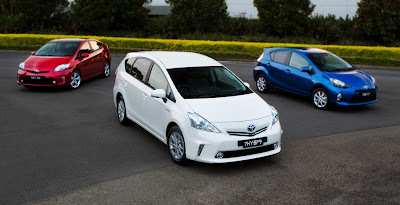 Almost three-quarters of the hybrids sold this year belong to the Prius family, including the third-generation Prius hatch, the new Prius c city car and the seven-seat Prius v.
The total also includes Camry, Auris and Yaris hybrids as well as Lexus hybrids such as the CT 200h, RX 450h and GS 450h. Since the first Prius went on sale in Japan in 1997, Toyota has sold 4.6 million hybrids around the world. More than two million have been sold in Japan and almost 2.6 million in other markets, including 45,000 in Australia. Toyota in Japan has calculated that its worldwide sales of hybrid vehicles have led to approximately 30 million fewer tons* of CO2 being emitted compared with petrol-powered vehicles of similar size and driving performance. On the same basis, the company says those vehicles have saved approximately 11 million litres of petrol (about 55,000 200-litre drums). For the first time in Australia, Toyota and Lexus hybrid sales will pass the 10,000-mark this year with 9,884 sold to the end of October. Mr Callachor said hybrids had increased their share of local sales to record levels this year - 33.9 per cent of all Lexus purchases and 4.5 per cent for Toyota. "Buyers of passenger cars in Australia are showing a greater move towards hybrids with sales up 50 per cent this year compared with growth of just 4.4 per cent for diesels. "In fact, the number of private buyers opting for diesel passenger cars has actually fallen this year while sales of hybrid passenger cars have doubled among private buyers," Mr Callachor said.